Hello again internet. 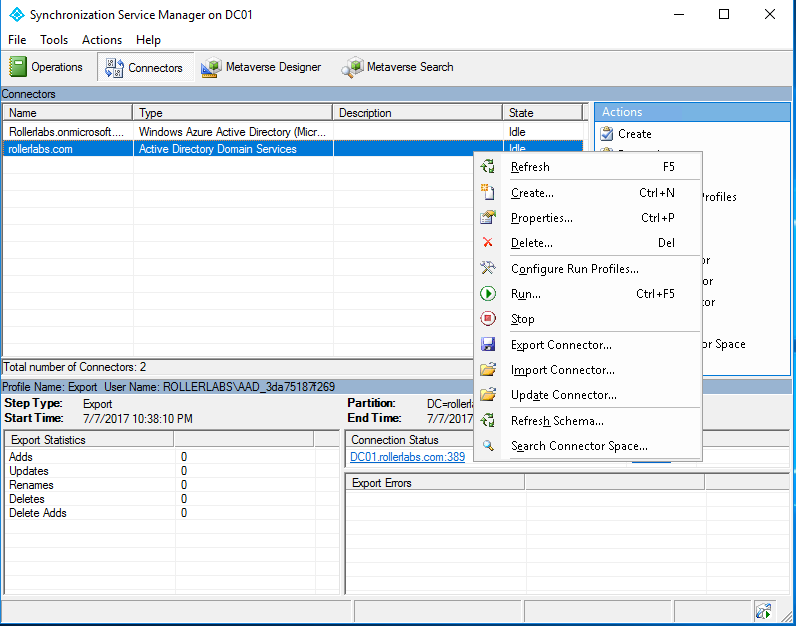 Had a quick post I wanted to write up on changing or adding new OUs to your AAD Connect sync filter. First lets start off with a little background information. After you install AAD Connect by default it runs what is called a 'Delta' sync every 30 minutes. This sync only syncs changes made to objects since the last sync. The inverse of this is an 'Initial' sync and runs a full sync against all objects regardless if they have been changed or not. This feature is useful for 2 reason. 1. Running an Initial sync is like giving AAD Connect the old turn it off and back on. Doing this can actually alleviate certain sync errors. I don't actually believe this is an intended use or feature of the Initial sync but what works in the field isn't always what works on paper. 2. Running an Initial sync will pick up any changes to your object filtering, such as adding or changing what OUs you are syncing. A regular Delta will not do this. Now that we have that out of the way lets get into how to actually change what OUs you are syncing. The easiest and best way to do this is through the 'Synchronization Service' GUI. If you ever messed with AAD Connects predecessor, Dirsync, then this will look familiar. Once you are greeted with the console above you want to go to the Connector button across the top ribbon. When you arrive at this page you want to right click the connector with your local domain name and choose properties. Once inside of the properties you want to drop down to Configure Directory Partitions and then choose the Containers button. You will then be greeted with a login prompt. Enter admin credentials with the proper permissions, which could vary depending on if you used express or custom setup. Once inside you will see a GUI with your AD layout. A simple check of the box, just like what you did during setup, can remove or add any OU. Yes that is the word sync in there twice. You can also use this command to do a -policytype Delta switch for those times you want to manually kick off a sync. Once you run this Initial sync all the objects in your new OUs should start syncing! If anyone stumbles upon this hope it helps you out some.